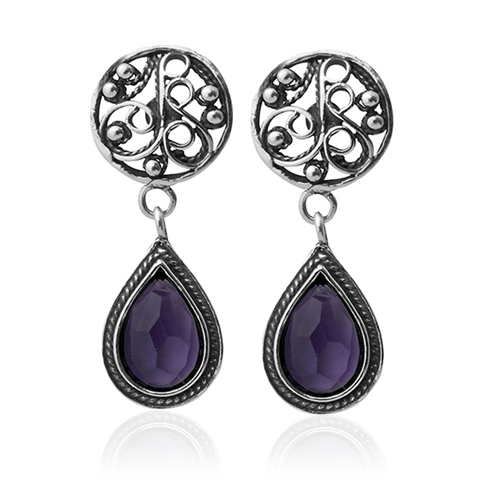 This elaborate pair of earrings sports a large teardrop shaped deep purple amethyst stone framed in silver hung from an equally large circle filled with curlicue designs, also made of silver. An ear decorated with inspired art such as these cannot fail to be noticed by bypassers. This spectacular pair of earrings is the perfect addition to the ear of any Jewish woman, for that extra little fine touch of virtuous beauty that you so richly deserve. Made of ultra fine silver and gold materials, these Israeli jewels bear a purely abstract shape, to be enjoyed as simple decorations by the wearer or interpreted at will to reveal one of its many meanings, and we recommend to be expressed with every fibre of the rest of the wearer's outfit. 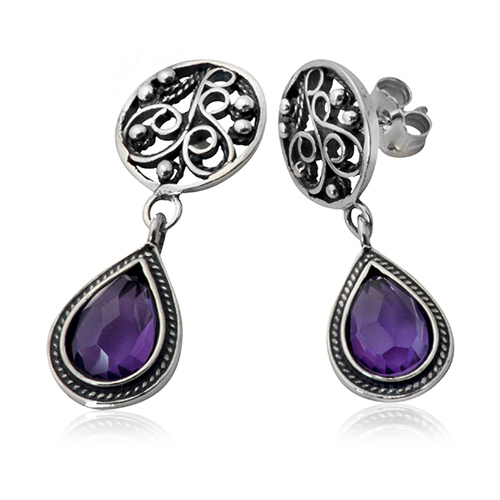 The dominant feature of the specific earrings in question are deep purple teardrop shaped amethysts mined in the southern Israeli city of Eilat framed in braid decorated silver; these centerpieces of the Israeli jewels at hand are then hung from a ring of silver filled with curlicue designs from which a hidden clasp extends to grasp the ear and enhance it in every meaning of the word.